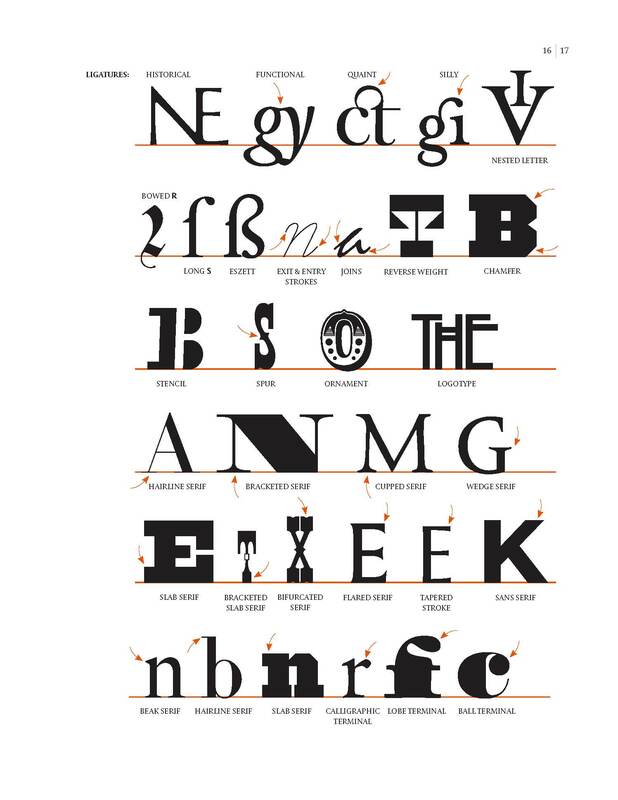 In 2014 I published three posts on the subject of letterform terminology. It is something that continues to be vexing to many people, including myself. Since then I wrote Revival Type: Digital Typefaces Inspired by the Past (New Haven: Yale University Press, 2017) with the assistance of Abby Goldstein. 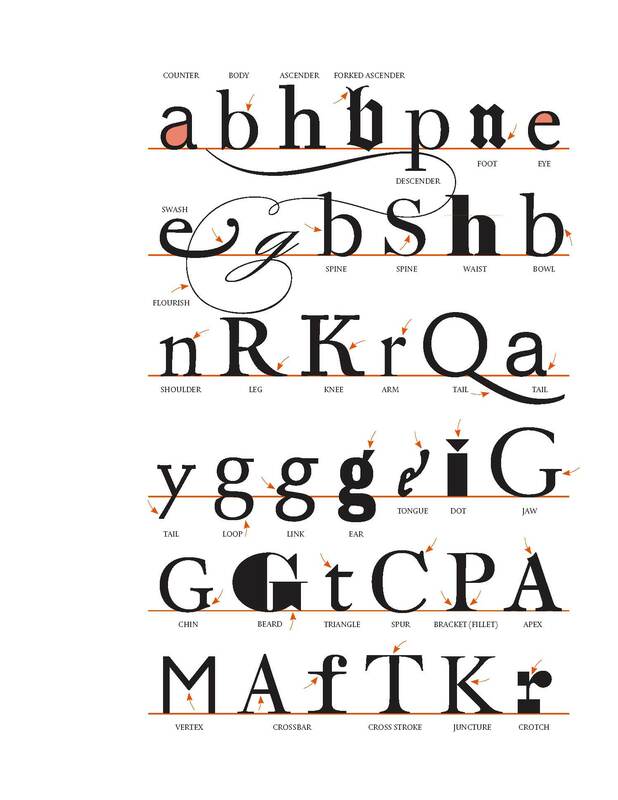 For the book she and I created what we consider to be an improved chart for identifying the parts of letters of typefaces. Instead of using a single typeface for the purpose, we used as many as possible—not only roman, but also italic, blackletter, display, and script. Some of the terms we invented (e.g. knee and silly ligature), but most come from existing typographic, calligraphic, and paleographic sources. These three charts are not the last word on the subject. Although Abby and I tried to fit as many terms into three pages in the book as possible, some were still left out (e.g. oblique, mansard serif, spur serif, tie). Terminology (p. 15) from Revival Type: Digital Typefaces Inspired by the Past by Paul Shaw with Abby Goldstein (New Haven: Yale University Press, 2017). Terminology (p. 16) from Revival Type: Digital Typefaces Inspired by the Past by Paul Shaw with Abby Goldstein (New Haven: Yale University Press, 2017). 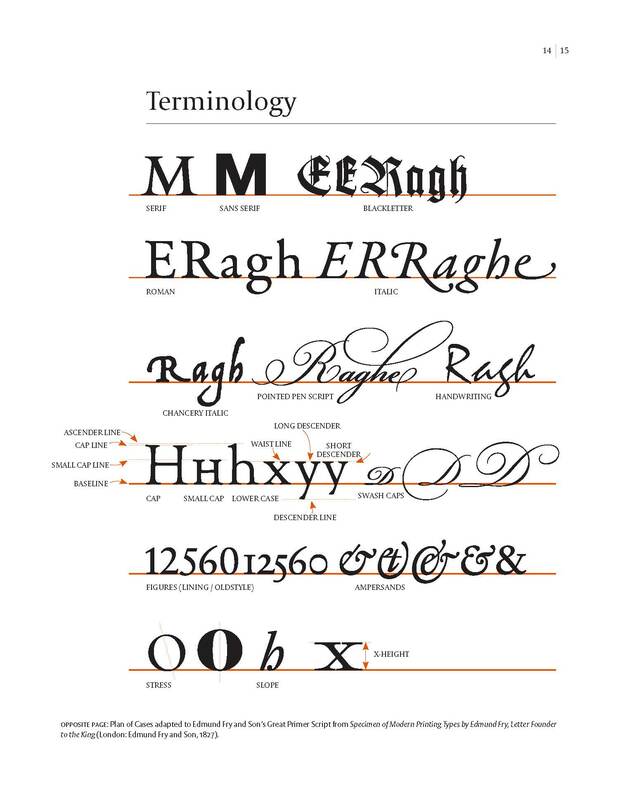 Terminology (p. 17) from Revival Type: Digital Typefaces Inspired by the Past by Paul Shaw with Abby Goldstein (New Haven: Yale University Press, 2017).